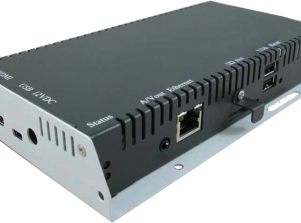 The XMP-2300 provides great flexibility for in-store installation by featuring wireless LAN connectivity. It enables deployment at locations where network wiring is expensive, such as at retail end-caps, isolated retail booths, and display totems. The device features the most comprehensive connectivity options, including wireless LAN capability, making it easy to deploy units at in-store locations hard to reach by network cables. In addition, IAdea’s large partner ecosystem enables cloud-based management via dozens of approved professional management software options. Device hardware features solid-state storage and advanced low-power computing technology, providing higher reliability for large project deployments. The ability to perform content, configuration, application, and even firmware updates over the cloud greatly reduces maintenance cost during the life cycle of large content networks. Check out our 60 second videos on Youtube.